Summary: Half Summer faery princess, half human, Meghan has never fit in anywhere. Deserted by the Winter prince she thought loved her, she is prisoner to the Winter faery queen. As war looms between Summer and Winter, Meghan knows that the real danger comes from the Iron Fey, iron-bound faeries that only she and her absent prince have seen. But no one believes her. Worse, Meghan's own fey powers have been cut off. She's alone in Faery with only her wits for help. Trusting anyone would be foolish. Trusting a seeming traitor could be deadly. But even as she grows a backbone of iron, Meghan can't help but hear the whispers of longing in her all-too-human heart. I really need to catch up on this series. I have not even read the first book. They look so good though. Sweet! So many great giveaways! I didn't read this one yet! i love this series. Please enter me! I NEED this book!!!!! I want it soooo bad! Please please please enter me in the giveaway! I want to win this so bad!! I definitely want this one!! Been waiting forever to read this, please enter me! This is a series I've really been wanting to read! Thanks! I've heard good things about this one! I still need to read the first one, but it is on my shelf! I've wanted to read this. This one has been on my list for a while, please enter me in your giveaway. been dying to get this one! I've heard so many good things about this novel. Thanks for the giveaway! i've been interested in this one since I saw it the first time on the blogs. 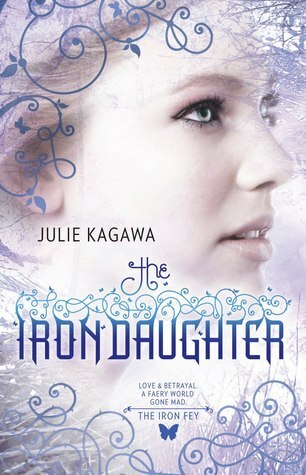 THE IRON DAUGHTER! Please enter me! Oh yes! Enter me please! I would LOVE to enter:) Thanks! Hear many good things about this one! i've heard nothing but good things about this series. I just finished this a few days ago! I read the first 1.5 and I loved them, I need to know what happens next! I quite liked the first one and would love to continue reading the series by winning this! Please enter me! I'd love to win.